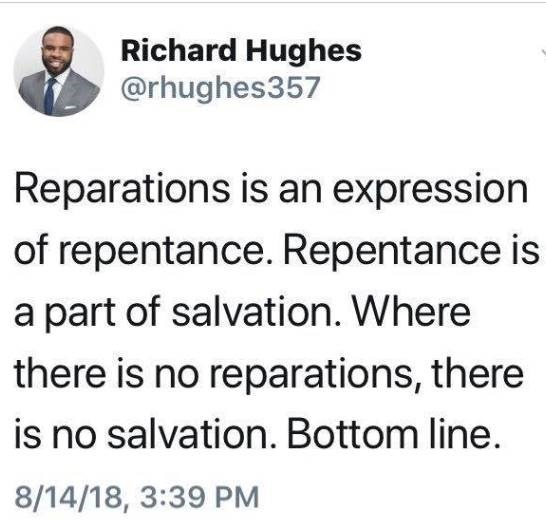 Major premise: Reparations is an expression of repentance. Minor premise: Repentance is part of salvation. Conclusion: Where there is no reparations, there is no salvation. Then we are told that this the “Bottom line.” If reparations are not made to those who have been oppressed, there is NO salvation. I remember John 3:16 telling us that all those who believe in God’s Son will have eternal life (salvation). II t doesn’t say that those who believe in Christ ‘and pay reparations’ will have eternal life. Don’t get me wrong. I’m not saying that making reparations for wrongs done is never warranted. The Old Testament has at least 6 references to making reparation (See Numbers 5:7-8; Numbers 6:12; Numbers18:9; 2 Kings 12:16; and Proverbs 14:9). In the New Testament, a tax collector named Zacchaeus, upon meeting Jesus, vowed to pay back what he had wrongly taken from taxpayers, with interest. That’s making reparation. So clearly, making reparation can be a very good thing to do. Note the DO part. The tweet from Me. Hughes just as clearly tells us that the ‘bottom line’ to obtain salvation is something that we MUST DO. OK. . . . .that was a bit more than a hint. Mr. Hughes is guilty of what has been called ‘The Galatian Heresy”. He has added works to faith for salvation. Sadly, making reparations is being called a ‘gospel’ issue by many evangelicals today. But is it? that’s the question. Did Christ die for our sins, or did he die for wrongs done to some members of our society by other members of our society? Is social ‘justice’ a gospel issue, or is the gospel the answer to all forms of social ‘injustice’?